Downtown is the historic heart of Stockton. 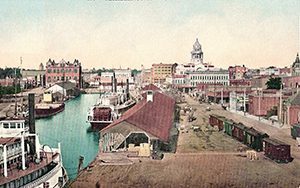 Founded in 1849 by Captain Charles Weber, Stockton began with a mix of thriving commercial ventures and colorful characters. 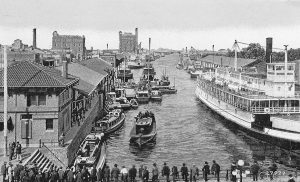 Industrious citizens altered the natural waterways running through the city to alleviate flooding, coordinated interstate water and rail with local transportation systems, and optimized Stockton’s strategic geographic location at the crossroads of California. 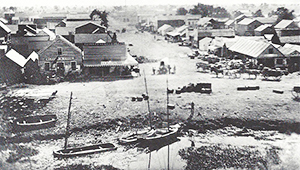 Stockton in the early to mid 1800s. Weber Avenue looking east. The dome of the courthouse built in 1890 is visible to the right.